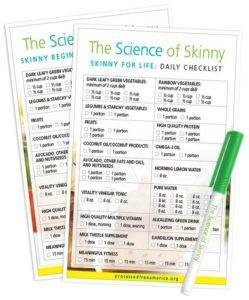 The Science of Skinny Checklist is an 8.5″ x 5″ laminated card with a simple listing of all the daily requirements for Dee’s life changing processed-free program. You no longer have to remember whether you had your daily servings of apple cider vinegar, veggies, or coconut oil. At the end of the day, just wipe the checklist clean with a moist paper towel and your ready to start fresh in the morning. The checklist ships along with a special Science of Skinny dry erase marker so you can start tallying your foods as soon as you receive it. Normally $9.95; Now available for Only $8.95 + shipping and handling.